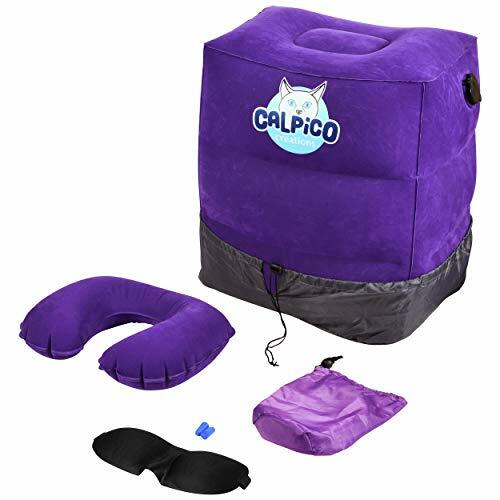 This Travel Inflatable Pillow Bundle For Family with Children made by Calpico Creations brings safety and sleep to you and your child. Let go of the anxiety of your little love one tossing and turning in uncomfortable seats whether that be on the airplane or car. Unlike other inflatable travel pillow, our soft velvet material, multi-height adjustable footrest will give you the angle you NEED! : Our versatile height-adjustable bed ALSO INCLUDES a neck pillow, earbuds, and eye patch too! RELAX WITH YOUR LOVED ONE - Not only will your baby have a great rest, so will you with our extra accessories. Ease your worry by placing your loved one in between the seats of an airplane or car! Softer, safer, and more reliable than other travel sleep accessories. This is the trusted choice among moms, dads, and any guardian. ADJUSTABLE DESIGN - Let the travel inflatable pillow adjust to you or your loved one's comfort with our three tier option! EASY TO INFLATE - You have the option to use the overhead air vent or you may blow it by mouth. Our easy airflow systems allow you to add and release air in seconds! TURN ECONOMY TO FIRST CLASS - with the long hours asleep with our Travel Inflatable Foot and Neck Pillow set you will wake up feeling great! We ensure that there is no BPA, phthalates, formaldehyde, lead and PBDEs (flame retardants). PACK LIGHT - this bundle allows you to shrink everything easy in your complimentary travel bag. Best gift for traveling parents with children. They will thank you soon! Unisex, gender-neutral newborn gift for the party, baby shower. Must-have essentials for parents of infants. Don't let this limited time deal slip away. Click 'ADD TO CART' to order your baby sleep wedge positioner today! ✔️ REAL SOLUTION FOR PARENT TRAVEL WITH KIDS: Immediately craft the perfect travel bed for your child to sleep through the night with easy inflatable leg rest pillow that rests securely between airplane and car seats. You will thank yourself for giving your toddler a smooth slumber. ✔️ HAVE IT YOUR WAY: 3 different heights allows you to use our inflatable air bed as a footrest in most cars and SUVs to provide support for your baby's feet to receive support. You also give yourself the gift of a neck pillow, ear plugs, and an eye pad to make up for the sleepless nights on the long ride. ✔️ SAVE SPACE, TIME & ENERGY: Lightweight, compact, and portable with carrying bag to hold your belonging. Everything that is contained can be easily packed into a small backpack. Inflatable to (17 X 15 X 9) and weighs only to 12 oz, this footrest can be inflated by mouth or by Cabin Overheard Air. ✔️ GIFT FOR FREQUENT TRAVELER: Long-Trips are difficult for children and the parent. Give the gift of a present for an inflatable travel bed, inflatable neck pillow, ear plugs, and eye pads to a new family friend and they will love it. ✔️ CUSTOMER SATISFACTION GUARANTEED: We are in the business of serving you. Love our products or money back. 100% guaranteed. For maximum comfort, inflate only to 90%. If you have any questions about this product by Calpico Creations, LLC, contact us by completing and submitting the form below. If you are looking for a specif part number, please include it with your message.